It seems we may never get a good adaptation of "The Fantastic Four." Fox has now tried twice (the first attempt resulting in two bad movies), and they've now failed twice. They got an exciting up and coming director in Josh Trank, who previously directed the very well received 2012 film "Chronicle" and an exciting young cast of well liked actors, yet the results are extremely underwhelming. I'm never sure where to apply blame, but I'm quite certain it belongs on many shoulders and not on any one person. The last few days, amidst scathing reviews, reports have been bubbling to the surface about the circumstances that lead to this terrible box office flop. There were reports that Trank was "combative" on set, and that's likely due to other reports of Fox's interference with the project. There are also reports that Trank was fired before post production began and thus not present for the extensive reshoots that took place just months before the films release. Trank himself has claimed that the final film was not his film. This is the most likely reason for the odd disjointed nature of some of the scenes and the tonal shift in the third act of the film. One way or another the end product is bad. It begins with a scene pulled straight from 1985's "Explorers" in which a young, science obsessed boy makes a sciencey project in his garage without his parents approval, with the help of his non-science minded friend. The result is a dangerous explosion. The boy is Reed Richards, and his friend is Ben Grimm. They're making a teleportation device, but their problem is they don't know where the things they're teleporting are actually going. To clear things up for the boys (now that they're older), and to recruit Reed to come work for him is Dr. Franklin Storm (Reg E. Cathey) and his daughter Sue Storm (Kate Mara). Without much adieu Reed (Miles Teller) leaves his childhood home and his friend Ben (Jamie Bell) behind to pursue this new project. That leads me to one of the early problems, aside from barely feeling like friends, Ben and Reed don't have much screen time together, in fact Jamie Bell is barely in this film. In the early scenes Ben is played by child actor Evan Hannemann, and later on as the Thing, he's portrayed by CGI. The film makes his origin story boring and generic. He was bullied by his brother, who would use the phrase, "it's clobberin time" before beating him up, thus making the origins of his catch phrase bizarrely absurd and a little disturbing. Nevertheless he's carried along by Reed in a disconnected scene in which, after having built the transporter, they intend to be the first to journey to the other dimension. It is, of course, where they get their powers, so he had to be there, but he's never given a good reason for tagging along. The dynamic between these now young adults is poorly established. Sue tells Reed she's adopted, and that's the extent of her background. Michael B. Jordan's Johnny Storm is given a scene that feels like a reject from some unfinished "Fast and Furious" film to establish him as the adventurous bad boy of the group. And as if we had trouble figuring out that the one named Victor Von Doom (Toby Kebbell) was the bad guy, he's introduced as a grumpy curmudgeon that would rather exist as a hermit than participate in society. His only reason for anger towards the group working on the project is a brief, underwritten moment in which he seems jealous of the attention Sue is giving Reed. 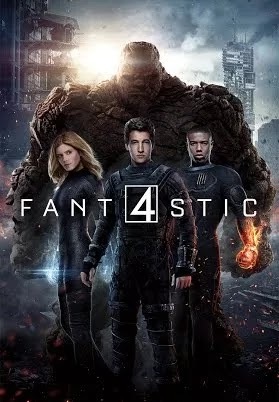 This supposedly "fantastic" cast feels disconnected to each other through the whole film. These blank faced, monotone characters never develop personality, and have all the ambition of a group of tired people going through the motions. There's not a single real emotion on display in a film that tries to take on a dark, gritty tone rather than the light-hearted fare that was Fox's first attempt at the story. These characters are supposedly friends, but there's little evidence of it. No one seems to bat an eye when Victor is supposedly lost in the fateful accident. At least the first film (as bad as is) attempted to show these transformed human beings learning to cope with their strange new powers and appearances, which is normally considered an essential part of an "origin" story. This film skips over this chapter entirely with a line of text saying, "one year later." There is a brief scene devoted to Sue looking as if she's barely getting the hang of floating and using her protective barrier, but it only serves to confuse the later scenes where she can use her abilities without difficulty. Ben has begun doing difficult missions for the military, and Johnny can't wait to put his powers to use for them as well. Reed on the other hand is given a brief diversion of a scene in which, after having escaped the compound, is found spending his days hiding and developing a new teleportation device in the hopes of finding a cure for their "afflictions." There is without doubt the evidence of heavy tampering with the film. Many scenes, including this one, feel as if they don't connect with the ones that came before or the ones that follow, and there is an unmistakable shift in tone towards the end of the film. In superhero films we should have learned by now that the portion of the film leading up to the discovery of their powers is never as interesting as what comes after. However Fox's film takes about an hour to introduce the powers, and very shortly after they're forced into the climactic final battle. Worse yet the film rushed towards this inevitable end before we've figured out quite what's going on. Dr. Doom, having reappeared in the last 20 minutes of the film, seems to have unlimited, unknowable power, and through some unexplained space magic intends to destroy the earth. It's all bright flashes and loud noises that don't amount to anything coherent. It isn't as though there aren't some fairly impressive sequences, but they don't connect to anything of value. It also isn't as if there was no potential to the story or its characters. Sadly what is there was clearly cut down to fit the intended runtime, and those reshoots cover up what might have been some sort of depth. Although I'm not even sure more scenes, or longer scenes would have helped. It's too many issues to be resolved by a few more scenes. It needs better characters, better performances, better writing, more clearly defined motivations, and some sort of purpose. When it comes down to it, the whole project feels like it lacks a sense of purpose. No one wanted a reboot of "Fantastic Four." Especially not one by anyone other than Marvel Studios. Yet Fox still owns the rights, and as long as they do they'll reboot these franchises until one of them sticks. They've had hit or miss success with their "X-Men" series, but "Fantastic Four" and "Spider-Man" have not yielded "good" results. Profitable maybe, but not "good" results. For now it's hard to know where to place the blame. Director Josh Trank clearly didn't get along with Fox. It seems clear there were mistakes made on both sides. One way or another we can only hope neither make another film this bad.